Prescription drugs have become the second most commonly abused category of illegal and illicit drugs, after marijuana. President Obama’s 2010 National Drug Control Strategy recognizes the damaging role of prescription drug abuse in American society, placing emphasis on “curbing prescription drug abuse by expanding prescription drug monitoring programs... and working with physicians to achieve consensus standards on opiate painkiller prescribing.” This Policy Brief examines the present state of prescription drug abuse and the potential role of Prescription Drug Monitoring Programs (PDMPs or PMPs) in providing real-time information to inform prevention, treatment, and law enforcement policies, programs, and practices. Identified as a serious emerging problem in Carnevale Associates, LLC’s 2004 brief, “Prescription Drug Abuse: The Silent Epidemic,” prescription drug abuse is now receiving considerable attention within America’s anti-drug efforts. As projected, prescription drug abuse is now at record levels and its use shows no signs of slowing. A growing number of first-time users (initiates) point to a continuing trend of increased use. According to the Substance Abuse and Mental Health Administration’s (SAMHSA) 2009 National Survey on Drug Use and Health (NSDUH), 6.9 million Americans abused prescription drugs in the past month (current use). In addition, 16 million Americans abused a prescription drug at least once in 2009, up 8 percent since 2002 (14.8 million). Perhaps most importantly, data show that pain relievers are the most frequently abused prescription drug, with 5.25 million Americans actively (past month) abusing drugs like Oxycodone and Hyrdocodone, and pain reliever abuse rising 20 percent since 2002. Contributing to this problem, the number of new prescription drug abusers—and particularly pain reliever abusers—continues unabated. Every year since 2002, 2.5 to 2.8 million Americans have abused prescription drugs for the first time. 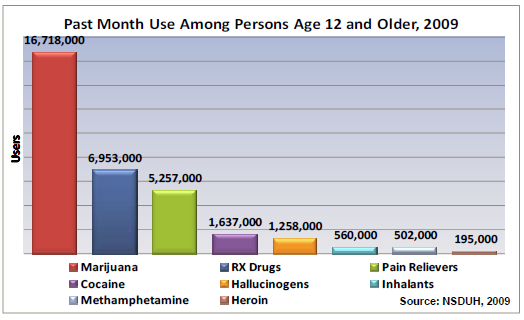 In fact, prescription pain relievers attract new users at a rate outpacing all other drugs but marijuana. Furthermore, the Centers for Disease Control (CDC) has already documented the damaging effects of this trend, finding that opioid analgesic overdoses have more than tripled between 2000 and 2007. PDMPs are statewide programs that collect data on controlled substance prescriptions. After collection, PDMPs disseminate information to prescribers, pharmacists, law enforcement, professional licensing agencies, and other licensed parties according to applicable state guidelines. As of March 2011, 34 states had operational PDMPs while 10 states and one territory had enacted PDMP legislation but not yet implemented their program. In addition, six states had legislation pending. Though not all PDMPs collect data on the same drugs, all PDMPs collect data on some set of controlled prescriptions, including patient information, prescriber information, dispenser information, drug information, and quantity and date dispensed. This information is stored in a secure centralized database and used to intervene with abusers and/or unscrupulous dispensers. However, the recipients of these reports and the way in which reports are disseminated vary considerably by state. PDMPs are often characterized as public health or law enforcement programs, depending primarily on whether law enforcement or health care entities are the main recipients of PDMP reports. In addition PDMPs have two primary federal funding sources, the SAMHSA National All Schedules Prescription Electronic Reporting (NASPER) Program and the Bureau of Justice Assistance’s (BJA’s) Harold Rogers Program. PDMPs are also distinguished by the manner in which they generate reports. Some PDMPs provide data proactively—generating unsolicited reports in cases of aberrant use patterns—while others provide data reactively—generating reports only in response to requests from licensed entities. Research indicates that the states with “proactive” PDMPs are more effective at reducing the per capita supply of abusable drugs than those with reactive programs. PDMPs offer a unique opportunity to inform our understanding of prescription drug abuse. Furthermore, because of their structure, PDMPs offer opportunities to enhance law enforcement, treatment, and prevention efforts in unique ways. While there is no research suggesting that PDMPs are the “silver bullet” for ending the prescription drug epidemic, research does suggest that PDMPs can be a powerful tool in shaping an appropriate response. For example, in select states, law enforcement can use PDMP data to confirm and target doctor shopping rings, doctors, and pharmacists that exploit their right to dispense controlled substances. In addition, PDMPs can help local drug coalitions and treatment providers identify emerging problems that require a programmatic response. Recent work led by Carnevale Associates, LLC in partnership with the Brandeis PMP Center of Excellence shows that aggregate PDMP data can identify problem areas, or prescription drug “hot spots,” worthy of special attention from policy and program managers. PDMPs are poised to become more effective as their scope and breadth continue to expand. Even now, some states are requiring PDMPs to alert health care professionals to aberrant behavior while still others (e.g. Iowa) are recommending that health care professionals be required to participate in PDMP programs. Research by Simeone and Holland (See, An Evaluation of Prescription Drug Monitoring Programs published in 2006 and Carnevale Associates’ brief) indicates that states may be able to increase PDMP effectiveness by increasing access to PDMP reports—disseminating them to both law enforcement and the treatment community. In addition, the same research suggests states may also benefit from transitioning PDMPs from a “reactive” approach to “proactive” one, increasing the flow of information to local demand reduction efforts. PDMPs have already received considerable media attention for their role in preventing and combating “doctor shopping,” the practice of obtaining multiple controlled substance prescriptions from multiple doctors. SAMHSA’s data suggest that doctor shoppers constitute a small portion of prescription drug abusers, with 55 percent of prescription drug abusers obtaining their drugs “for free from a friend or relative.” However, there are indications that the doctor shopping may be a growing phenomenon. Evidence from the Simeone and Holland study suggests that PDMPs effectively reduce drug use by modifying prescribing habits—reducing the surplus of abusable drugs and, in turn, reducing abuse. With most users obtaining drugs for free, the simplest way for PDMPs to effect change is to modulate prescribing habits. Though still in its infancy, de-identified aggregate PDMP data can provide a treasure trove of data to local prevention planners and law enforcement professionals. While person-specific reports regarding individuals’ behavior are restricted to authorized personnel, PDMPs also house massive quantities of depersonalized information that can fuel data-driven coordinated programs at both the state and local level. Because PDMP data cover both use and prescribing habits, they can provide policymakers with near-real-time aggregate data on locations and trends in prescription drug abuse, as well as abuse “hot spots.” For example, PDMP data may tell policymakers that aberrant use is on the rise in a particular community, allowing them to shift funding or programmatic focus to respond to real-time needs. These PDMP data can inform the implementation, placement, and funding of a host of existing programs including: provider training and education, school-based programs, prescription drug take back programs, and law enforcement operations. In the realm of prevention, PDMP data appear particularly well suited to existing data-driven prevention efforts including those under the purview of State Epidemiological Workgroups (SEOWs) and SAMHSA’s Strategic Prevention Framework (SPF), including SPF State Incentive Grants (SPF-SIG). Similarly, in law enforcement, PDMP data have obvious value in data-driven policing, like Compstat. Finally, policymakers can also use PDMP data to close the feedback loop, monitoring the success of their policies, programs, and practices by monitoring abuse patterns. With prescription drug abuse initiations continuing unabated, PDMPs are a valuable tool to construct and monitor data-driven prevention, treatment, and law enforcement activities. While PDMPs alone will not end the prescription drug epidemic, they can help inform local demand reduction policy about how to best target resources to mitigate use and its damaging effects. CALLC recommends that national drug control policy focus on developing training and technical assistance regarding how best to utilize PDMP data, including guidance on streamlining access to de-identified aggregate data. In addition, CALLC recommends developing and disseminating information on best practices for communities that are seeking to curb prescription drug abuse. In these fiscally austere times, PDMPs offer policymakers the ability to craft strategic policies—maximizing their funding and yielding effective programs.